Tell me a little bit about your story. 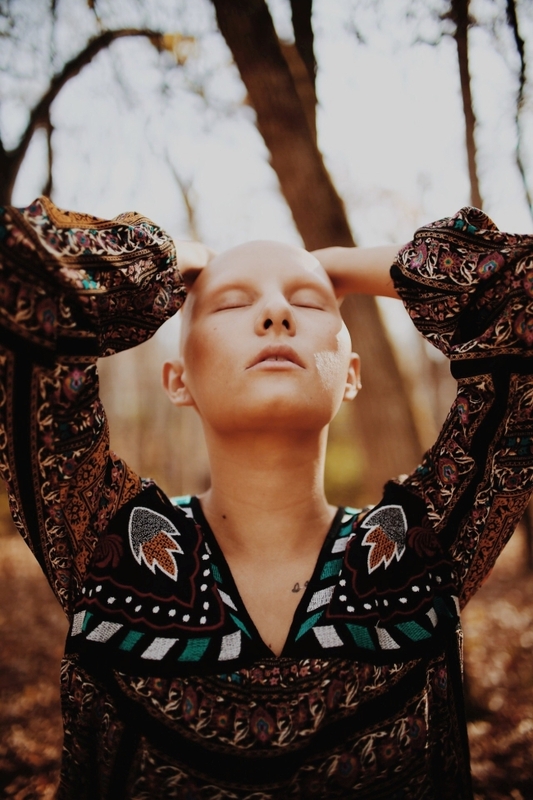 What does it mean to have alopecia? I was diagnosed with alopecia when I was 9. Alopecia is an autoimmune disease that causes my hair to fall out. There’s no cure and there’s no cause. During high school, Alopecia really started to take over who I was. I wouldn’t go to school some days from the frustration, I hated looking in the mirror, I was depressed. I was 19 when alopecia took almost 50% of my hair. When I was 19, I chose to take control of an uncontrollable disease- I cut off the remainder of my hair and finally felt free from alopecia. I lost my eyelashes, eyebrows, and body hair within the years after that. Alopecia is tough, but it’s made me the brave, confident woman I am today. How and why did you start taking self-portraits? What goes on in your mind before you take a photo? I started taking self portraits to show myself that I am beautiful. Sometimes looking in the mirror doesn’t always capture that beauty. For me, photography is therapeutic. I capture parts of myself that I don’t always see. I try to portray those parts of myself in my self portraits. You have so much self-love and it’s inspiring! Where is your strength coming from? First of all, thank you! My strength comes from support. I have surrounded myself with people that love who I am and I think that, that is so important to do. That’s how you learn to really truly love who are you. Do you think Instagram – or social media in general – embrace uniqueness? How was your experience when you decided to put yourself out there? We are all so incredibly different and that’s what makes us beautiful. When I see a photographer focusing not only on the beauty of a person, but also the story that comes along with the beauty, that’s what catches my eye. My experience, so far, has only been a positive one. If I can just show one person, how being different is beautiful, then I’ve done enough. You’re beautiful and I love how powerful this photo is. Is there a story behind it? Something you would like to share? I met with a photographer in downtown Chicago. We started to shoot and he stopped and told me to tell my story through my eyes. And this is the outcome- this exact photo. Have you planned anything for the near future? Any photography projects you wish to do? I really just love shooting with anyone that has a genuinely, creative idea and that wants me to be apart of it! I’d really love to plan a trip to LA and meet with a few amazing photographers out there!